Have I mentioned before how much I love caramel? It’s my absolute fave, and mixed with crispies and chocolate – nirvana! Next time I make these, I’ll add crispies or nuts. I’ve made caramels each of the last two years, and I’ll post the recipe and pictures closer to the holidays. I saw Julia Baker make chocolate caramel truffles on her Cooking Channel show Sweet Julia, and thought they looked easy and delicious. Right on both counts! Last week I went to my friend Joanna Campbell Slan‘s Beta Bash, where her Beta Babes got together in Jupiter, FL. Her Beta Babes are her beta readers, those valuable fans of her writing who have volunteered to read early drafts of her works in progress and give her feedback. Friday night eight mystery authors talked about their latest books at the Apollo School in Hobe Sound, and Joanna invited the Babes and the authors to her home for dinner beforehand. The authors participating were: S.L. Menear, Gregg E. Brickman, Miriam Auerbach, Randy Rawls, Deborah Sharp, Diane A.S. Stuckart (aka Ali Brandon), Elaine Viets, and Joanna Campbell Slan. I’ve linked their names to their websites for you – you might discover a new favorite author. 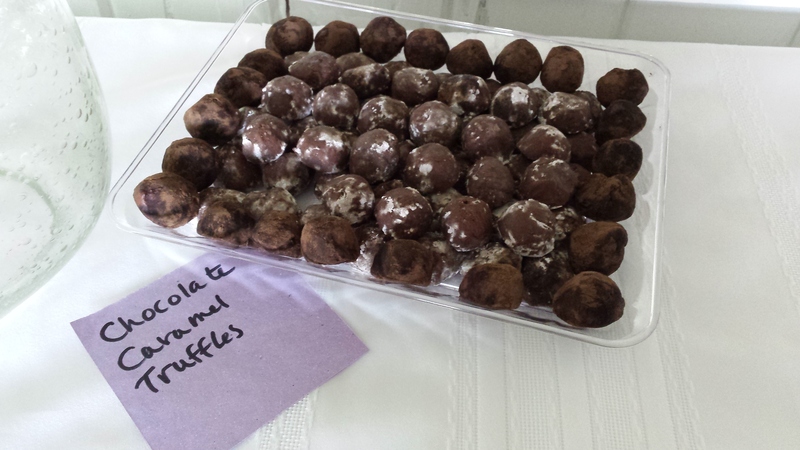 I made these Triple Chocolate Caramel Truffles for the dessert table. Put all of the chocolate chips and the butter (and salt, if necessary) in a large bowl, and set aside. Combine the sugar and water in a medium pot and heat over medium-high heat until the sugar dissolves. In a separate pan, heat the heavy cream until tiny bubbles form around the edges of the pan. Heat the sugar/water mixture to a boil and cook until the sugar turns the color you prefer. NOTE: DO NOT stir the sugar – swirl to distribute the color evenly. Remove the cooked sugar from the heat, and add the warmed cream. Tilt the pan away from you, and stir constantly with a wooden spoon or rubber spatula. The mixture will rise up considerably, so use a pot with high sides. Stir until well combined. Pour the caramel over the chocolate chips and butter. Whisk until smooth. Dissolve the coffee powder in the vanilla and stir into the chocolate caramel. Pour into a shallow pan and refrigerate until firm (at least 45 minutes). Pour confectioners sugar into a bowl or plate. Using a small ice cream scoop, form truffles. 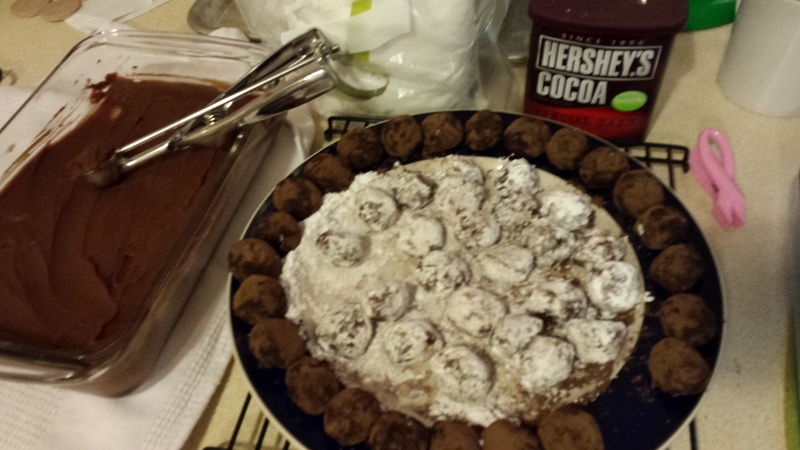 Drop truffles in confectioners sugar and roll to coat. In another bowl or plate, put dark cocoa powder and roll truffles in it. Put coated truffles in a dish and chill. Before serving, let sit at room temperature for 30 minutes.